#RainyContest2014: and the Cup goes to…. The time has come, signore e signori! The entries were plenty and all very professional yet personal. Thank you! You can check some using the #RainyContest2014 hashtag on Twitter or read some on my FB Page now… The moment all were waiting for. The #rainycup goes to… A gentleman, for a change! Who said the ladies are over-represented!? 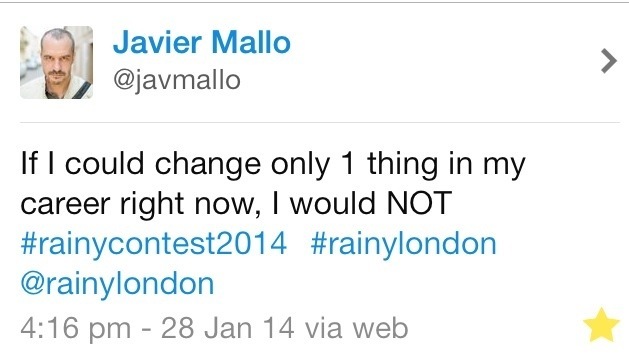 I give you Javier Mallo (@javmallo)! Please get in touch to claim your cup 😉 And to all who took part: THANK YOU again for the love! London-based Rainy London Translations is offering a full range of top quality interpreting, localisation, translation, consultancy and voice-overservices for both businesses and individuals. Need something else? Just ask! It may sound like a cliché, but just get in touch: what you need can be done, at a reasonable price. Valeria is also offering a 'branding' clinic service, to help freelancers find their perfect business name or polish the existing identity by finding a logo, a tagline with sound creative consultancy. Based in the City of Westminster area, the heart of London, UK, since August 2011.